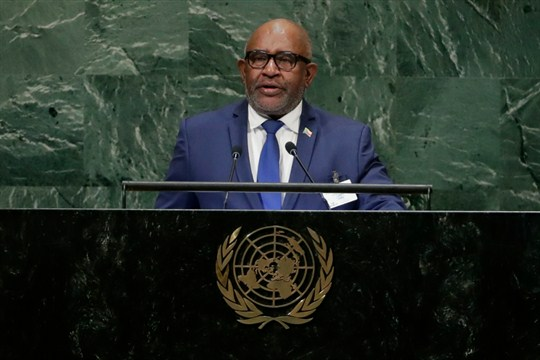 Comoros’ president, Azali Assoumani, addresses the 73rd session of the United Nations General Assembly at U.N. headquarters, New York, Sept. 27, 2018 (AP photo by Frank Franklin II). Comoros’ Supreme Court has certified President Azali Assoumani as the winner of last month’s presidential election with 59 percent of the vote, despite protests from the opposition and serious flaws in the voting process. At least three people were killed in a failed uprising at a military base several days after the election, prompting the United States to withdraw its personnel from the islands. Meanwhile, the opposition has been decimated by a campaign of arrests and intimidation, says Simon Massey, a senior lecturer in international relations at Coventry University. In an interview with WPR, he discusses the possibility of further unrest in the coup-prone country and the direction Comoros is likely to take under Assoumani’s continued rule.